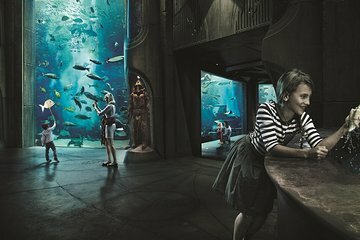 Discover a world of exotic marine life with an entrance ticket to The Lost Chambers Aquarium at Dubai’s Atlantis The Palm resort. Made up of chambers and lagoons themed around the legendary undersea city of Atlantis, the spectacular aquarium houses a world of tropical sea life. Explore at your own pace and see radiant reef fish, seahorses, rays, sharks and countless other creatures, including those in the vast Ambassadors Lagoon. Make the most of your time at the resort by upgrading to include same-day entrance to the Aquaventure Waterpark. Watch the little ones at the new Splasher’s Island with 7 brand new kid-friendly waterslides ranging from body slides, tube rides and a mammoth dry play-structure. Travel independently to the Atlantis The Palm at The Palm Jumeirah in Dubai, and head for The Avenues area, home to The Lost Chambers Aquarium. Go inside with your entrance ticket and enjoy the displays and attractions as you wish, in your own time. Made up of 10 chambers and other exhibits, The Lost Chambers plays host to more than 65,000 marine creatures and is themed around the mythical, lost ancient city of Atlantis. Marvel at the beautiful marine life on show, from reef fish to seahorses, sharks, rays and even baby alligators. Use the interactive touchscreens to find out more about the species in the chambers and gaze transfixed at the vast Ambassador Lagoon, where hundreds of tropical fish and other sea life waft through the waters. After checking out the chambers, enjoy an included behind-the-scenes tour. Chat to a marine guide about the undersea creatures and hear fascinating stories about the day-to-day workings of the aquarium. If you wish, take your pick from any of the special interactive experience (own expense) on offer, such as scuba diving or snorkeling in the Ambassador Lagoon. Your Lost Chambers experience concludes when you exit the aquarium. Aquarium and Aquaventure Upgrade:Why not enjoy the Atlantis The Palm to the max by upgrading to include entry Aquaventure Waterpark? Choose to upgrade and you’ll get a same-day, all-day admission-only ticket to Aquaventure to use before or after The Lost Chambers. Head inside the park and dive into the aquatic rides and slides as you please, at your own pace. Zoom down the super-steep Leap of Faith slide into a shark-infested lagoon, float along the lazy rivers, and watch the kids enjoy the Splasher's Island. For a break, simply relax on the beach, or enjoy the shops and restaurants (own expense). I arrived at the Atlantis in my small fuel efficient rental car and wow, they valet parked my car. The Atlantis was buzzing with activities and peoples from all over the globe. It was so nice to see and feel the warmth and welcoming of staff as well as other visitors. The Lost Chambers is fantastic. The sea creatures are contained in beautiful and well designed displays. There are so many interesting species to observe. There are small tanks with precious sea horses, colourful fish. The larger tanks are full of a vast array of larger mammals - different types of stingrays, large fish, sharks, etc. It is amazing to watch them 'fly' in the water. They are so elegant and move with such grace. The different displays of jelly fish are fascinating to watch as they move slowly in the water. I had fantastic photo opportunities and come away from my experience with great memories as well as awesome photographs. Truly a beautiful venue with warm and helpful people running it and working at it. Loved my day!!!! It was good in general, but we expected to be larger. However there are lots of interesting species, which could be seen there. Beautiful. Takes about 30 minutes, though. Great for kids. Very dark--tough to take pictures.